First four items in Dash begin "Find" "Find" "Find" "Find"
"Find Media Apps" becomes "Media Apps"
"Find Internet Apps" becomes "Internet Apps"
"Find More Apps" becomes "More Apps"
"Find Files" remains as "Find Files"
1. Click the Ubuntu button. 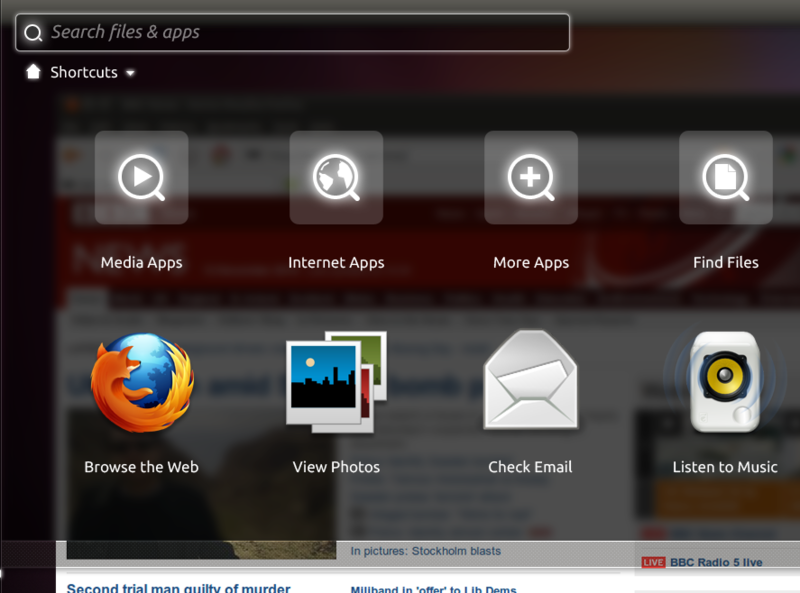 What you see: "Find Media Apps", "Find Internet Apps", "Find More Apps", "Find Files". Repeating the same word several times in close proximity is tacky. If it's not obvious enough that these items are for finding things, change their icons so that it is obvious. What you should see: probably something like "Media", "Internet", "Other Applications", "Files". It may make sense to fix bug 730865 (about the naming of "Find More Apps" specifically) at the same time as this bug. somewhere that you can search. how else to attack the problem, let's hear it out. Alan Cooper has a useful dictum here: "Visually show what, textually show which". That you can search inside them is great, but it's not relevant to labelling them -- that's already shown by their icons. 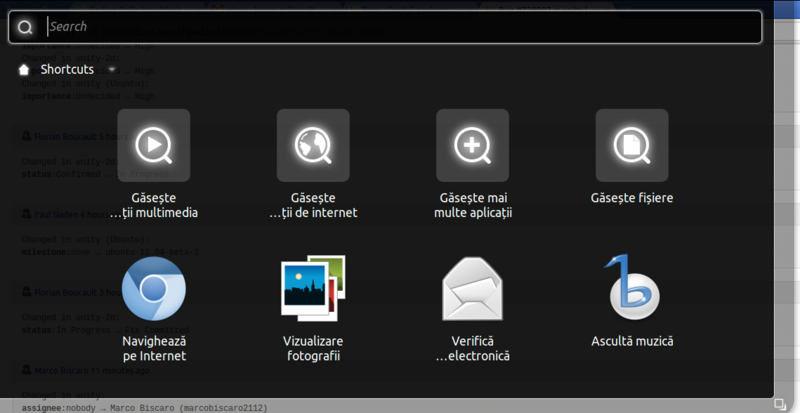 The text should be reserved for what is unique about them: "Media", "Internet", "Other Applications", "Files". MPT, are you requesting that the Lens links are renamed to "Media Apps", "Internet Apps", "Move Apps" and "Files", and that the application links are renamed to "Web", "Photos", Email", and "Music"? No. I am suggesting that "Find Media Apps", "Find Internet Apps", "Find More Apps", and "Find Files" be relabelled to "Media", "Internet", "Other Applications", and "Files" respectively. That "Media" and "Internet" are application categories would be visually explained by their similarity to the adjacent "Other Applications" icon. And the labels for the individual applications are out of scope for this bug report. Is this sane, or insane? As far as I can tell, all information asked for here has been provided, so there's no reason for the bug report to expire from being Incomplete. If I've missed anything, please let me know. Mark has approved removing "Find" from each label. Is there a specification somewhere I should update to reflect that change? The closest I can find is <http://use-case-mapper.canonical.com/specifications/0AblM3dK0felBZGZjMnNmY2tfODJjcDd0aDhmZg>, but it doesn't mention the labels for the items. > Mark has approved removing "Find" from each label. the file manager, but the dash file search interface. This also affects translations: sometimes the translation is too long and some useful info is replaced by ellipsis.